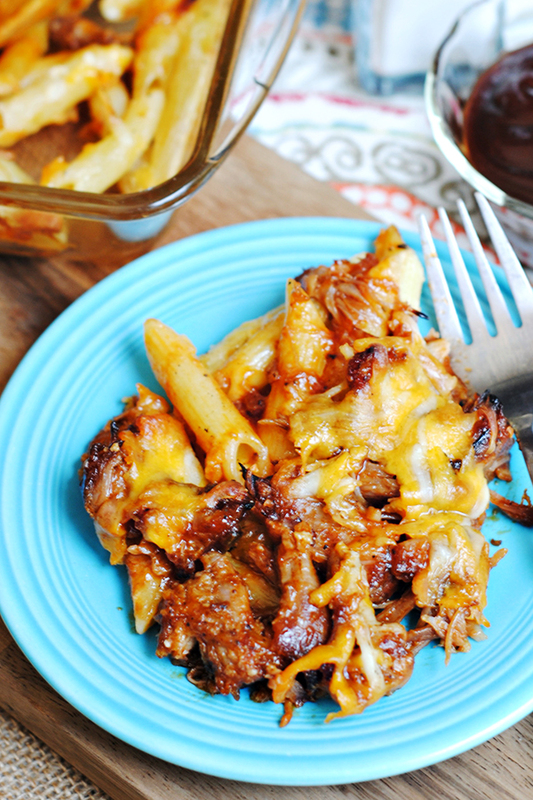 This easy BBQ Mac & Cheese Recipe features a homemade macaroni and cheese that is topped with pulled pork or shredded chicken that has been deliciously smothered with barbecue sauce. 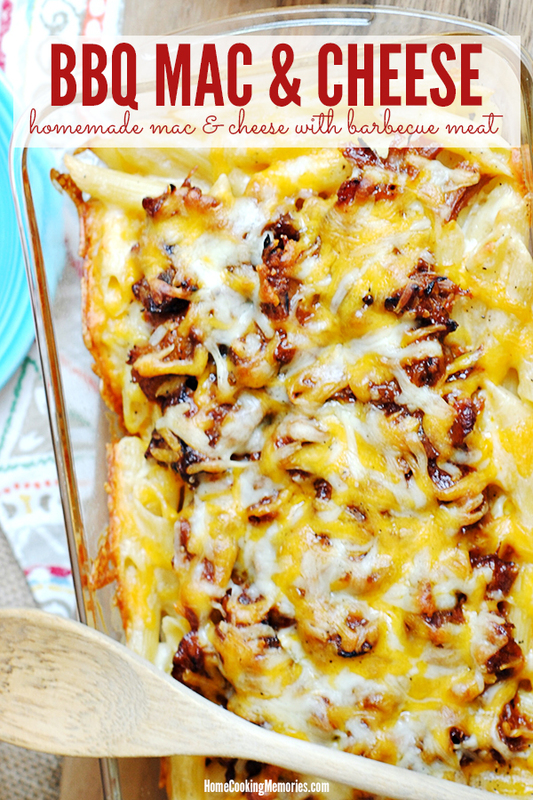 With just a few ingredients you can pull together a homemade mac and cheese with a barbecue twist! It’s simple to make, comforting, and absolutely delicious. 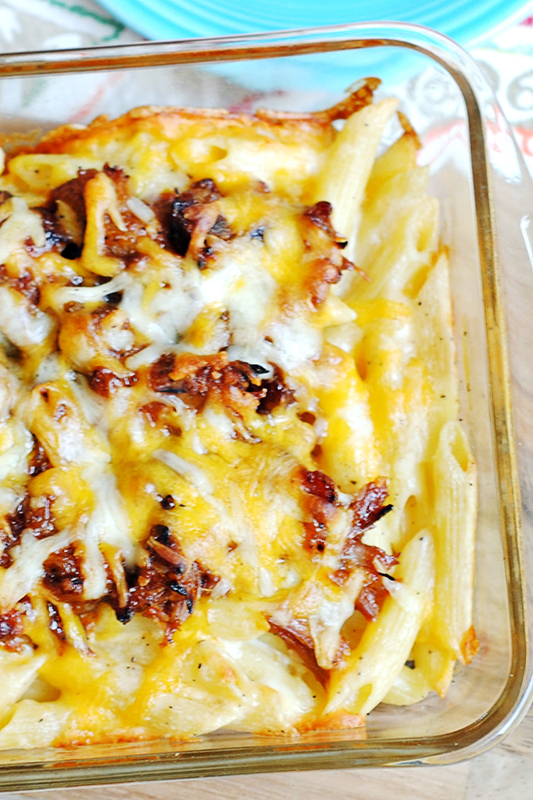 This recipe is great for dinner any day of the week, but also perfect for game day. For this recipe, you will need: cheese, pasta, evaporated milk, butter, a few seasonings, plus pulled pork or chicken that has been combined with BBQ sauce. You have several different BBQ meat options for this recipe. We think the best way to make this recipe is to use up BBQ leftovers that you might have had for another meal. You can make it with your choice of meat: pulled pork, pulled chicken, or beef. If your leftover BBQ meat isn’t already covered in BBQ sauce, simply pick your favorite BBQ sauce and mix the meat up with it. Once you have your BBQ meat of choice, you’ll cook and drain your pasta according to the instructions on the box. Add your pasta back to the pot and combine with evaporated milk, cheese, butter, and seasonings. Spoon into a 9×13″ baking dish and top mac & cheese with your bbq meat, leaving a 1-2″ edge of the mac & cheese not covered. Top with additional shredded cheese. 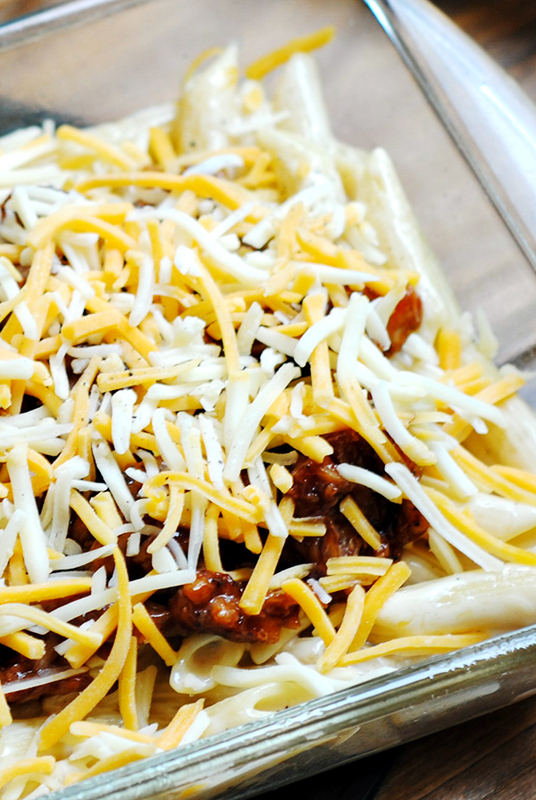 Bake until hot and the cheese has melted and it’s ready to serve! The full recipe is located below, ready for you to print, if you wish. If you like this recipe, be sure to share it on Facebook or pin it on Pinterest. 1. Preheat the oven to 350 degrees. Spray a 9×13″ baking dish with non-stick cooking spray. 2. Bring a large pot of water to a boil and cook the penne pasta according to package directions and drain. Pour the cooked pasta back into the pot and add in the evaporated milk, about 2 1/2 cups (10 ounces) of the shredded cheddar and/or monterey jack cheese, and the parmesan cheese, and stir to combine. 3. 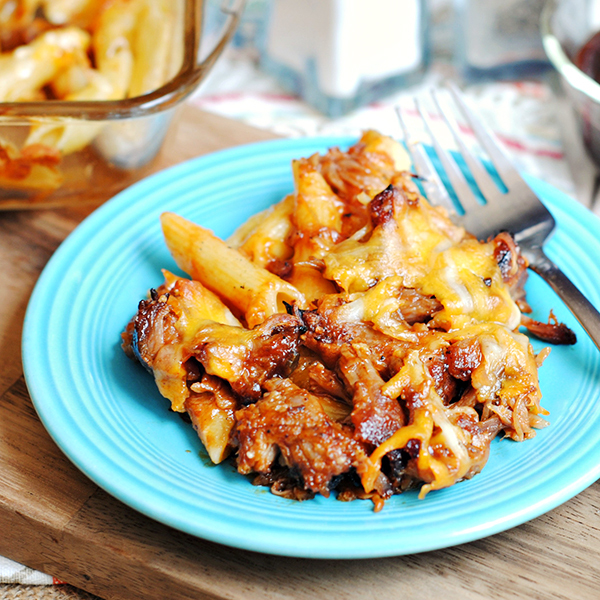 Pour the mac & cheese into the baking dish and top with leftover BBQ meat. Sprinkle with remaining cheddar and/or monterey jack cheese. Bake 20-25 minutes until heated through and cheese is melted. Serve with extra BBQ sauce, if desired. –You can substitute other types of pasta. 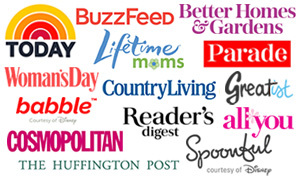 Other recommendations: elbow, farfalle (bowtie), fusilli, rotini, or shells.